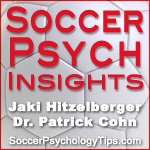 In this episode of Soccer Psych Insights, Jaki Hitzelberger and Dr. Cohn discuss one aspect of mental preparation- managing high expectations. Managing high expectations is a very important part of mental preparation because high expectations can hurt your confidence in soccer. We certainly want you to set challenging goals for yourself, but focusing on very strict expectations for your performance, is not going to help you execute during a game. Expectations and confidence are very different in soccer. We want you to believe in your ability, but avoid demanding perfection. Instead, you want to create small performance cues that focus on what you need to do to execute. Listen to this episode of Soccer Psych Insights to learn how to manage high expectations in order to perform with confidence.